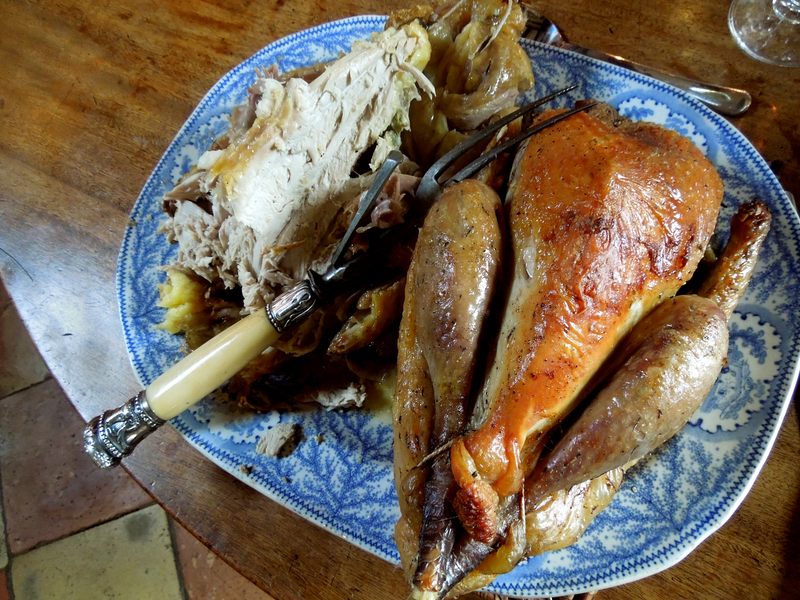 I love guinea fowl, it’s a delicate but very juicy and flavoursome meat. To my mind, it tastes as I remember chicken tasting when I was a child, before intensive farming bred the flavour out of so much of it. I’m very lucky because my fat, free range guinea fowl come from P.A. Mobbs, where I also buy my Christmas turkeys, and at up to 5lb in weight they’re almost twice the size of some of the birds you see in supermarkets. 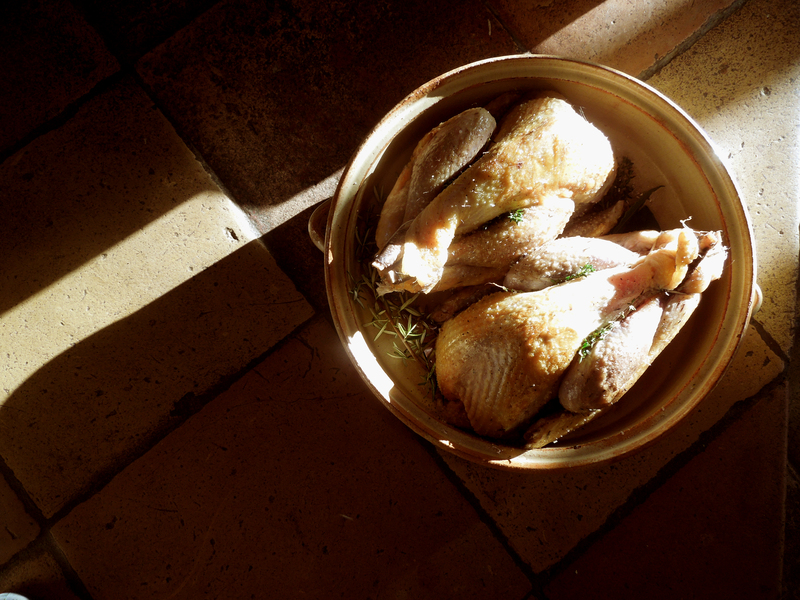 But if you can’t get guinea fowl, this recipe works well with good, free-range chicken. It’s very simple but very tasty. I was cooking for a big lunch party so I used two plump birds. If you’re only cooking one, you should still keep the remaining ingredients to the quantities listed, but you may need to reduce the cooking time a little. Pre-heat the oven to 160C/320F/Gas Mark 3. 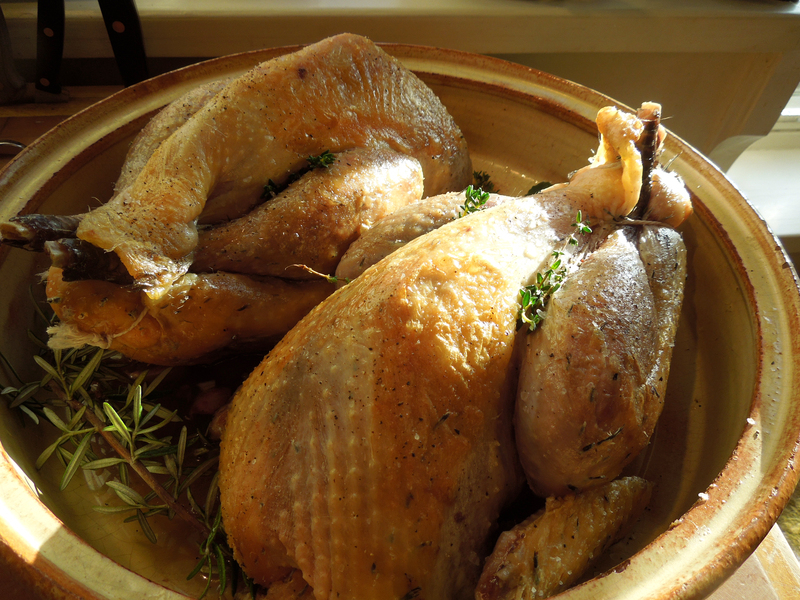 Season the birds well with salt and freshly ground black pepper. Heat two tablespoons of olive oil with a good knob of butter in a flameproof casserole, one that has a lid. Brown the birds all over, remove and keep warm. 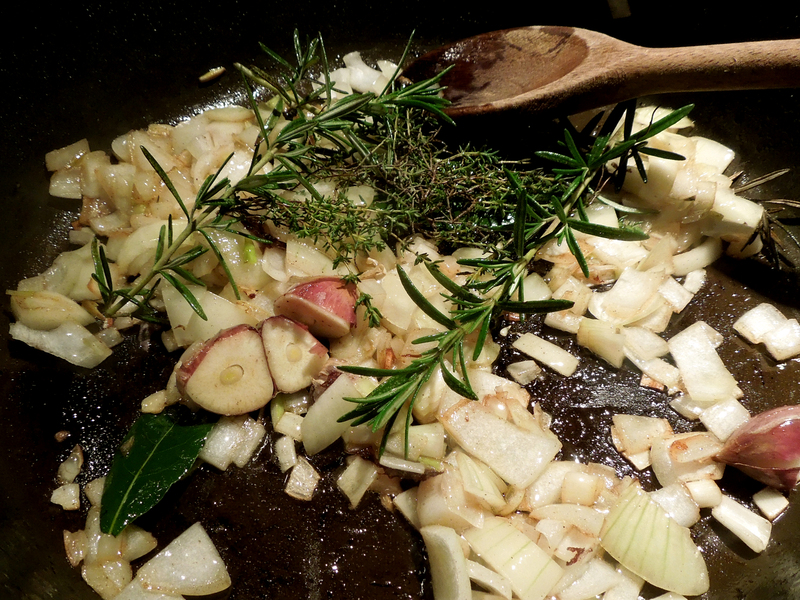 Using the same pan, add the onion, garlic and herbs and cook until the onion is soft and translucent. Pour in the wine and let it bubble up for a minute or so. Add the stock, put the birds back in the pan, cover and cook in the pre-heated oven for around two hours or until thoroughly cooked and the juices run clear if you poke a knife into the thickest part of the leg. Take the dish out of the oven, remove the birds and keep warm while you skim the fat from the sauce and if necessary, let it reduce and intensify a little on the hob. Strain it, check the seasoning and serve with the guinea fowl. This entry was posted in Chicken and other poultry, Mains and tagged pot roast chicken, pot roast guinea fowl, pot roast guinea fowl with wine and herbs by Linda Duffin. Bookmark the permalink. Just a top dish Mrs. P., and couldn’t agree more about the ‘old-fashioned’ flavour of the bird. That looks beautiful! I love Guinea Fowl, I’ve never cooked it though. Looks delicious. I adore guinea fowl. Sadly, hardly anybody here eats it and it’s rare to find. Even my grandparents, who raised guineas (!) apparently never thought to eat them. We thought about getting some ourselves, but the constant “pot rack” cries are rather annoying. People around here seem to have the idea that they’re good for insect, tick, etc. control. I guess that’s why they had them. Interesting. I’ve never tried the eggs, have you?